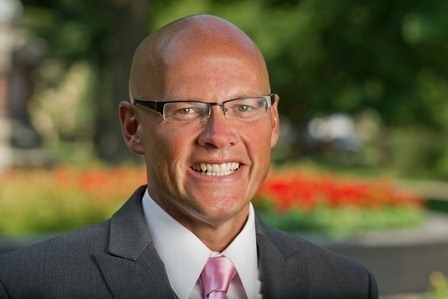 Vote for Dean Crawford to be named next Everyday Superhero of Biotech! Greg Crawford, William K. Warren Foundation Dean of the College of Science, has been nominated as an Everyday Superhero of Biotech by the BIO International Convention. Nominees are selected for their dedication to heal, fuel, and feed the world through groundbreaking innovation in three categories: biotech/pharma, patient/patient group, and university/research institution. Final Superheroes will be selected in each of the three categories by public voting. Voting is now open and voters can support Crawford in the in the university/research institution category. One vote per email address is allowed daily until voting closes at 11:59:59 p.m. ET on March 25, 2015. Winners will be announced at the BIO Exhibition in June. The nomination for this award is based on Crawford’s dedication to raising awareness and research funding for Niemann-Pick Type C (NPC) disease. NPC disease is a rare, fatal neurodegenerative disease that primarily strikes children before and during adolescence. The disease causes cholesterol and other lipids to build up in the body’s cells, which results in symptoms such as delayed motor development, deterioration of memory and balance, and seizures. The University of Notre Dame has partnered with the Ara Parseghian Medical Research Foundation to find treatments and a cure for NPC. Understanding of the disease has significantly improved over the years and clinical trials are currently underway for a promising treatment discovered by Notre Dame researchers and their collaborators. To help raise funding for NPC research, Crawford has completed four cross-country bike rides that totaled more than 11,220 miles. During these rides, he visited 120+ cities, held events with 60+ Notre Dame alumni clubs, and educated millions of people about NPC through a blog and 140+ media stories coast to coast. In addition, he has collaborated with Notre Dame athletic teams to raise money on campus. Crawford’s efforts have helped raise $1 million, which has been used to fund both NPC research and the current clinical trials. This summer Crawford will embark on his fifth and final cross-country bike ride May 25-June 26 with the goal of raising $1 million for NPC and other rare disease research at Notre Dame’s Boler-Parseghian Center for Rare and Neglected Diseases. 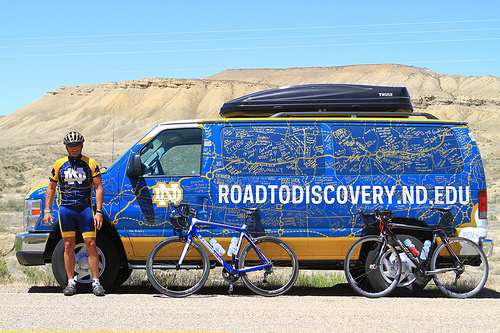 The ride will be documented on his daily blog, roadtodiscovery.nd.edu. Originally published by Stephanie Healey at science.nd.edu on March 17, 2015.